Adults look forward to seeing a child’s face light up at the sight of a new toy during the holidays. But as we begin to shop this season, safety should play a critical role when selecting that special gift. We get advice from Amy Boillinger, manager of the Pediatric Trauma and Injury Prevention Program at Penn State Children’s Hospital. Description – The video begins inside at a Penn State Children’s Hospital conference room. Two people are standing next to each other with toys on a table behind them. Standing from left to right is Scott Gilbert and Amy Bollinger. Scott Gilbert – From Penn State Health and Penn State Children’s Hospital, this is Ask Us Anything About Toy Safety. I’m Scott Gilbert. Well, for many of us, children are on our holiday shopping list, and that means toys are on the list. And we want to make sure that when we’re out there buying toys for children this holiday season, we don’t just find something they’ll like and play with, but also something that’s safe. And here with some tips on how we can do just that is Amy Bollinger. She’s manager of the Pediatric Trauma and Injury Prevention Program here at Penn State Children’s Hospital. Welcome back to Ask Us Anything About Amy. Amy Bollinger – Thanks, Scott. Scott Gilbert – You know, we’d like to think that toy recalls do their job, right? And that anything that’s dangerous gets recalled. But, in fact, the truth is, you know, when we walk into a toy store, there are some dangers on those shelves, especially depending on the age of the child, and some other factors. Amy Bollinger – There really are. We have to be very cautious about what we buy for our children and the children we love. We want childhood to be fun. That’s what being a kid is all about, especially at the holiday time. But there are dangers and risks, and we want to find the balance between finding something that’s fun for a child, but also keeping him or her safe. Scott Gilbert – So let’s start with the youngest children, like ages one to five, right? So they’re, they’re at an age where they probably don’t perceive danger that well. Amy Bollinger – They do not. So, that’s our largest patient population in pediatric trauma. Our children ages one to five, we see a lot here. And that’s because young kids are just learning to explore their world. They don’t understand the difference between a toy that’s safe and a toy that is dangerous. They just see a toy. And they want to have fun with it, explore it, because that’s their job. Their work is play. Scott Gilbert – And so one of the most common dangers for them are choke hazards. Scott Gilbert – And I know you brought some examples, so let’s turn the table behind us and look at some of these here. Where do we want to start? Amy Bollinger – We can start with the toy tester. Scott Gilbert – So this is a great idea here. These tubes can actually, even just a regular old toilet paper tube, can be a useful tool for parents. Amy Bollinger – Right. That’s exactly right. So this is called a toy tester, and you can buy this on many different websites. It costs a few dollars. If you don’t want to spend the money, a good old fashioned toilet paper roll will work just fine. And the premise behind this is if the toy is too small for your child, or is a choking hazard, it will fit completely. This is a marble. It will fit completely inside the toy tester, and therefore, be a choking hazard and a risk for choking for your child. Same thing with a toilet paper roll. You take a marble. If it fits inside, it’s too small for a young child under the age of five. Scott Gilbert – And like I say, a lot of us probably, we can guess that a marble or small things are going to be choke hazards. But things that are a little bit bigger that we think may not be, they fit in that tube, and therefore, we don’t want to get them for young children. Amy Bollinger – That’s right. That’s right. The younger the child, the higher the risk of choking, and the higher the risk of injury. But still, we want to be cautious and make sure the toys that fit inside the toilet paper roll may not be safe. Scott Gilbert – And so I’ve got two children at home. One is about four years older than the other. And so that’s a pretty common scenario. So one of the things to watch for in that case is younger children playing with the older child’s toys, right? Amy Bollinger – Absolutely. For those of us who have more than one child, we know that the younger sibling usually idolizes and wants to do whatever the older sibling is doing. So, that is a big risk with kids getting into their older siblings’ toys. For example, we have a Barbie. And Barbies are great for older children. But a small toddler gets into this… Thank you. Amy Bollinger – Here we have a Barbie shoe that’s very, very tiny that could be a choking hazard. We have other little pieces and parts of the Barbie that could be a danger. And the same is true for boys, as well. There are toys that boys use to build, and they have small pieces and parts. And when they’re building their toys with small pieces and parts, young children can get into them. They typically want to put everything in their mouth, and that’s when the choking piece comes in. Scott Gilbert – And so we see a toy like this, like a doll is obviously not a choking hazard. Scott Gilbert – It’s the accessories and the parts we have to think about. Amy Bollinger – That’s exactly right. We worry about the small parts. Scott Gilbert – Sure. So a choking hazard, many people may not realize is one, is a common balloon. Why? Amy Bollinger – Well, balloons are made out of latex, and once the balloon pops, that latex becomes a slippery piece of rubber. It’s very easy for a young child to put that piece of rubber in his or her mouth, have it go back and completely block off their airway. When that happens, it kind of crumples up inside the trachea, and it is almost impossible to get out emergently. And that’s a real risk for little kids, for small children. Scott Gilbert – You’re watching Ask Us Anything About Toy Safety to Penn State Health and Penn State Children’s Hospital. We welcome your questions for Amy Bollinger. She manages the Pediatric Trauma and Injury Prevention Program here. You can put them in the comment field, whether you’re watching this video live or after the fact, and we’ll get you some answers in the form of a live response or a comment reply. We’re talking about choking hazards right now. And here’s an interesting, here’s an interesting one here. Something that, it’s a hidden choking hazard, because it exists inside of things like this, the common key fob that almost all of us have for our car. It’s the button battery. Amy Bollinger – So this is a button battery. Button batteries can be found many different places. They can be found in remote controls, in hearing aids, they can be found in bathroom scales, they can be found in those keyless entry systems for sure. And this is a surgical emergency. So if a child swallows this, what happens is the battery starts to erode through the esophagus, the stomach lining, or the intestines. And that, and when I say erode; I mean it puts a hole right through their internal organs. Scott Gilbert – Because there are chemicals, acids. Amy Bollinger – Right, chemicals and acids that are used to conduct the electricity to make the toy light up, or the object work, but they’re not meant for our insides. Scott Gilbert – And one more choking hazard to touch on that has kind of another complication. And that’s magnets, small magnets that can be swallowed, and what those can do inside the intestine. Amy Bollinger – That’s right. So if you think about how a magnet works, one magnet sticks to another magnet. If that happens inside your body, that also becomes a surgical emergency, where children come in and we have to take them to the operating room and remove those magnets. It can cause obstructions in their intestines and can cause a tremendous amount of pain for a child. Amy Bollinger – You’re not a fan of slime. Scott Gilbert – I’m not, but my daughter is. And, you know, there are a lot of kids out there that are because it’s easy to make, it takes laundry detergent and a couple other chemicals, but there are also kits available in the toy store. Scott Gilbert – There’s a chemical in some of those kits that parents need to be aware of. Amy Bollinger – That’s right. It’s called boron, B O R O N, and that is a chemical that in higher doses may not be safe for children. It’s not regulated in other parts of the world. So if it’s manufactured in other countries and is imported into the United States, it may have higher than normal levels of boron, and that can be unsafe. We know that if boron is ingested, it can cause nausea and vomiting. There is some question about reproductive health in people as they age if they’ve had high levels of boron exposure as children. The other thing that we’ve seen that our pediatrician colleagues have shared with us is that they sometimes see burn like rashes on children’s hands and their forearms, anyplace lots of slime has touched. Scott Gilbert – And these are things, like you said, we see them here at Penn State Health. Amy Bollinger – Yes, that’s right. Scott Gilbert – We see them in our emergency department. We see kids who have swallowed button batteries in here. Amy Bollinger – Yes, we do. Scott Gilbert – So we’re not talking in the abstract. Amy Bollinger – No, no. I was speaking with a colleague yesterday, and she shared with me that on average once a month we see kiddos here who have swallowed a button battery and are in trouble and need some kind of surgery to remove it. Scott Gilbert – So there are a lot of products out there that have a high amount of lead content. Scott Gilbert – And fortunately a lot of those have been recalled. Amy Bollinger – They have. Scott Gilbert – But are there, are there certain ones, certain types of items that we should watch for? Amy Bollinger – So I would say all lead is not good for children. So if you’re looking to purchase something, it’s a good idea to always look at the table of whatever it is you’re buying, to be sure that it doesn’t list lead as a part of the chemical makeup, or a part of the manufacturing makeup of the toy. Scott Gilbert – And we’ll share some links, including two links to some lists of recalled products that include high levels of lead and some other things. So our emphasis so far has been on younger children. Scott Gilbert – But we know that there are dangers out there for older kids as well, especially those who crave action and playing outside on bikes and scooters. Amy Bollinger – Are adrenaline junkies. Scott Gilbert – Exactly. How do we address some of those? Amy Bollinger – So the biggest, the most common injuries we see in pediatric trauma with any child under the age of 18 are injuries to the brain and injuries to bones. So we want to, we want to protect your brain, our kids’ brains. So if you are buying a toy that has wheels or goes fast, please buy the helmet to go with it. For example, this is a bike helmet. You can buy them at many large retail stores for under $15. You want to make sure it’s fitted correctly, and there are instructions on the helmet packaging to tell you how to, how to apply it safely. And we say every time. If your child is going out on a bike, your child needs to have the helmet on. Scott Gilbert – It’s about forming the habit. Amy Bollinger – Right, right. Scott Gilbert – And where it comes to a helmet like this, I’ve also seen in those instructions that if a child takes a spill and the helmet impacts the ground, it’s probably time to get a new one. Amy Bollinger – That’s right. So I’m a mom of one of those adrenaline junky kids that we talk about. And I have memories when he first learned to ride a bike, he’d put his helmet on, and he’d get two blocks down the street and take it off. And I’d see him. And when he’d come back, I had to pull out the mom hat and there had to be a consequence. So he got in the habit. He understood that no, no helmet meant no bike. Scott Gilbert – And here’s my son’s bike helmet. No, that’s actually not true, but this is an example of a helmet we might use for sports and that type of thing. Amy Bollinger – For sports, especially winter sports. So this time of year, as it gets colder, we’re going to see children out on ski slopes and on hills, and they’re going to sled, and they’re going to ice skate and snowboard. And again, when you go fast down an icy, snowy hill, you’re not always in control of whatever it is you’re riding on. So you want to be sure that you protect your brain. Because brain injuries are, many times, not reversible. Scott Gilbert – Let me play devil’s advocate. Scott Gilbert – Pretend I’m a teen and say, “come on, mom, that’s not going to happen to me.” Is that a common attitude? Amy Bollinger – All the time. We see it all the time. Teenagers have a complete inability to understand the consequences of risky behavior. That’s just how their brains work as teenagers. As they age and get into their 20s, that executive functioning comes. But most teens do not have that executive functioning ability at 14, 15, 16, 17. So we talk a lot about thinking through the consequences of your behavior. Think it through. Talk me through. What could happen? What could go wrong? Yes, it sounds like Debbie Downer. Yes, it sounds like a nagging parent. But we’re teaching our children to then think through consequences of their actions. Scott Gilbert – You’re watching Ask Us Anything About Toy Safety from Penn State Children’s Hospital. I’m Scott Gilbert, alongside Amy Bollinger. We welcome your questions. Just add them to the comment field. And also, we hope if you find this content important and helpful, as we hope you do, that you’ll share it on your Facebook page, or even tag a friend in the comments section, maybe somebody who has some children or grandchildren that they’re buying for this holiday season. And we’re talking about fun outside, some risk taking. I think of various vehicles children like to use; bicycles, scooters. There’s also hoverboards. Scott Gilbert – Hoverboards have gotten some bad press. Scott Gilbert – And, in part, that’s deservedly so. Amy Bollinger – Yes, we have seen, in our experience here at the Trauma Center, we have seen children who have become very critically injured, and some who have died because of unsafe hoverboards. The issue for hoverboards are twofold. The first issue is they have to be plugged in to charge the battery. And some of those hoverboards’ batteries have caught fire. And then typically they’re charged, they charge overnight. So a family plugs the hoverboard in, goes to sleep, the battery overheats catches fire and the house catches fire. And that’s, that has deadly consequences. Scott Gilbert – So do your research online. Scott Gilbert – Check the recall list. Amy Bollinger – Look at the, look at the recall list. Make sure that you’re buying a hoverboard that has not been recalled. Scott Gilbert – Because I imagine, especially if you go on Craigslist or something and buy a hoverboard there that’s been used, that’s a great way to get rid of one that’s been recalled. Amy Bollinger – Correct. And, you know, for all intents and purposes, you don’t always know what you’re buying when you buy something on a site like Craigslist. You have to be extra cautious if you choose to do that. Scott Gilbert – So, as we wrap things up here, I want to kind of take it back to something you said earlier on. And that is, we’re not trying to tell kids to not have fun, right? Scott Gilbert – I mean, we realize toys are about fun. The holiday season is about fun. We’re not trying to be all bah humbug. Scott Gilbert – But we are trying to keep people safe. Amy Bollinger – Correct. My kids go sledding. My kids do fun stuff in the wintertime. Scott Gilbert – You let them out of the house. Amy Bollinger – I do. And I do not put them in bubble wrap, although they might tell you otherwise. I do let them out of the house. But you have to know what the risks are. You know, it’s our job as parents to protect our kids when they can’t necessarily do the right thing to protect themselves. That comes with age. With age comes wisdom, right? So we know that if we can give them those skills now, teach them what they need to know to be safe, protect them until they have the wisdom, they’re going to be safer, and hopefully not come to the trauma center. Scott Gilbert – And hopefully parents will make some great buying decisions based on the advice you’ve provided today. Thanks very much. Amy Bollinger – I hope so. Scott Gilbert – Appreciate your time. Amy Bollinger. She is manager of the Pediatric Trauma and Injury Prevention Program here at Penn State Children’s Hospital. 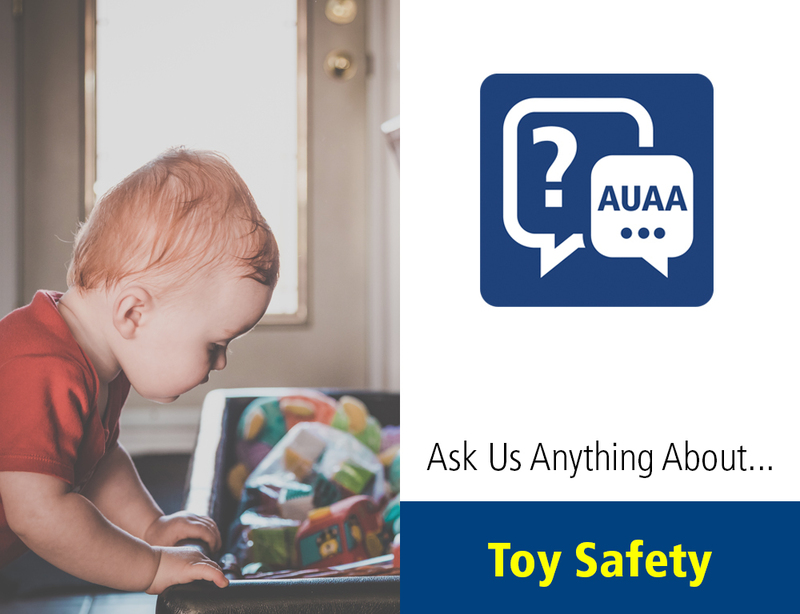 We thank you for your time, and we thank you for watching Ask Us Anything About Toy Safety from Penn State Health.